The weather might have been cold outside but the warmth of the reception of Mark Stephen Gregory, the representative of the Provincial Grand Master, and the rest of the guests as they gathered for the Blainscough Lodge No 8532 installation, was positively ‘roasting’. It was a team effort in which all ranks took place. 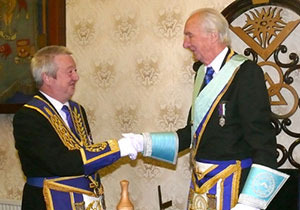 The lodge’s grand lodge officer presented Allan as master elect, contrasting with three ‘non-worshipful brethren’, as Stephen was to later describe them, presented the working tools. Congratulations to Paul Wilkinson, Nicholas Hansen and Neil Williams on three excellent presentations. Following the very high standard set, Brian Hoarty then addressed the WM, Joe Hall the wardens and Mark Stephen Gregory the brethren, all in an exemplary manner. Pictured left: Peter Lockett (left) presents an MCF certificate to Allan Farrington. Pictured right: Chris Jones (left) toasts the new master Allan Farrington. As is customary at an installation, the first task of the new master was to make a presentation to charity which Alan duly performed and Stephen informed the brethren that Blainscough had generously donated £1,000 to the MCF 2021 Festival, £250 to West Lancashire Freemasons’ Charity, £50 to Ecclesholme, £100 to the Masonic Fishing Charity, £500 to Chorley Masonic Hall Association and £700 to Chorley Help the Homeless, this when added to £50 to the RNLI and £120 to Manchester Homeless Women’s Charity donated previously came to the magnificent total of £2,770. At the end of the ceremony, the brethren retired to enjoy each other’s company and a three-course meal. After the meal, the brethren witnessed a first, the master’s song being sung unaccompanied by the immediate past master! Well done Chris Jones! All too soon it was time for the tyler’s toast and for the brethren to head home having enjoyed a wonderful night of excellent ritual in the lodge room, good food at the social board and good company throughout the night. Pictured from left to right, are: Mark Howard, Don Hesketh, Stephen Gregory, Allan Farrington, Chris Jones, Peter Lockett and Joe Hall.